Gail Simone has been a regular on my pull list, thanks to her consistently top-notch work on comics like The Atom, Birds of Prey, Secret Six and, yes, Wonder Woman. But when my LCS owner asked me if I’d been reading Welcome to Tranquility, I stammered. Anyone who’s familiar with Simone’s writing knows that she does funny and macabre very well, often within a single panel. Those talents are on full display in Welcome to Tranquility, a Wildstorm comic about a town inhabited by retired superheroes and villains. And what a cast. There’s Minxy Minerva, a daffy millionaire and former child pilot prodigy who crashes frequently. Emoticon is a young troublemaker who wears a mask displaying text symbols that reveal his mood: smiley faces, for instance. 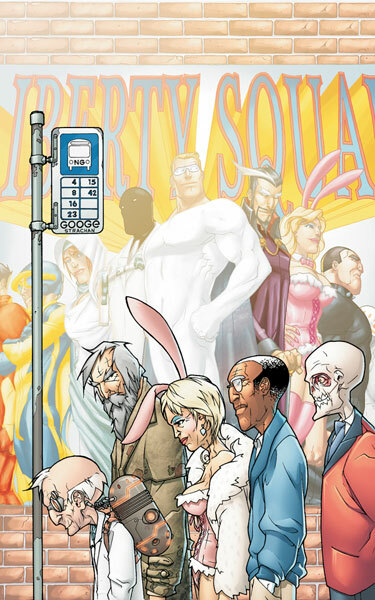 Mayor Alex Fury, the former leader of a Justice Society-type group, presides over the town of Tranquility and lives with his wife and fellow former hero/pinup Pink Bunny. In the middle of it all is beloved Sheriff Thomasina “Tommy” Lindo, who eschews profanity and instead blurts out words like “bull doody.” Personally, I’m stoked to see a black female comics character in a leading role. Sheriff Lindo is the glue and conscience of Tranquility, perhaps the most ironically named town ever. This place is anything but peaceful, roiling with secrets, intrigue, juicy backstories and crazy developments, which result in good read. 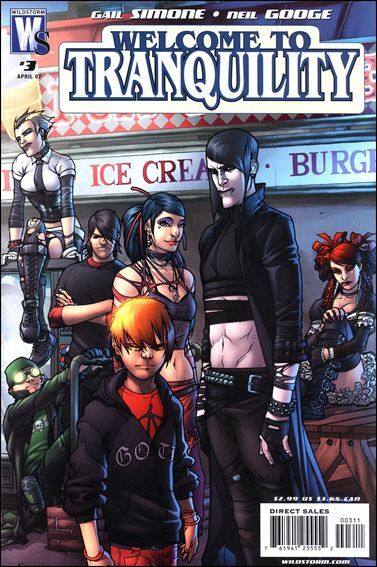 There’s also a nifty subplot involving the Liberty Snots (formerly the Tranquili-teens), a band of young heroes that has shed its clean-cut, TV show image and gone Goth. And punk. Simone has a lot of fun with old-school comic book tropes, like random product-placement ads, one-page gags and “Scooby Doo”-like stories featuring the Tranquili-teens in their G-rated heyday. Though Wildstorm is soon to be no more, Simone told Newsarama that the current series has been completed, and that the remaining issues will be published as planned. So go ahead and dive in. Glad you’re pimping out Tranquility…I’ve been pushing SOME people on this blog to read it for ages! Well, now said person has TWO geeks to borrow the comics from, so there’s no excuse! Damn it, how many books is Read This Too going to make me pick up!? This is one of a long list of comic books I discovered just as they were being canceled. I picked up the first trade, went looking for more, and discovered that it was over, so I forced myself (with difficulty) to wait for the second trade instead of just buying the individual issues. More recently, when I picked up the first issue of One Foot in the Grave, I decided I needed to skim the first two books to remind myself of the various backstories. Don’t do that at 11:30 at night. A few hours later, I realized I’d read through the whole thing again! Kelson, I almost wound up doing the same thing! The first two books are so engrossing, and it’s all too easy to lose a couple of hours to them. Again. Love it. I covered the first two trades with a Hidden Gems column a while back. Hey, we did our bit to keep Wildstorm in business. So glad to hear that others dig this cool series. One issue even had a meatloaf recipe. Now THAT’S value. This one sounds like a ton of fun – I’ve never even heard of it before. Another one to add to my list! Welcome to Tranquility is one of those books I fell in love with, but eventually lost track of. I started with the very first issue and was totally engaged. Somewhere down the line I missed an issue or decided to save some money. Regardless, I haven’t collected the series in some time and now regret it. I absolutely loved the character of Emoticon. Just thinking of him cracks me up! Also, the role of the Sheriff sort of reminds me of the TV series “Eureka”. The small town Sheriff with all the crazy antics around them. One small nitpick, I gotta disagree with your LCS owner. “Birds of Prey” is Gail’s baby. “Welcome to Tranquility” is Gail’s beloved nephew or niece. Just my two cents. Great review! And you’ve motivated me to seek out the issues I’ve missed!